Tim always complains that this blog makes him look like an idiot. I always reply "Get your own blog." 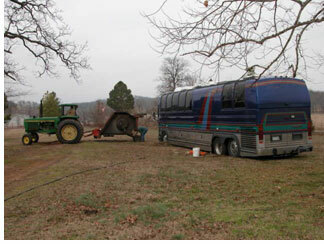 Well, after he gets the bus stuck in the mud (and we need cousin JT to pull us out with his tractor) he agrees that he will, and call it, "I Am An Idiot." We found you through Vanture. We are a family of four and are planning to live full-time on our new bus conversion. We homeschool our kids and we would like to show them everything we can while we study. My wife and I are musicians, and we plan on touring and doing concerts across the country in our coach. Our website www.twiceone.com will give you an idea of what we do. You sound like you are having fun with your travels, but I bet you'd have more fun if you had kids with you! I have to admit though that we look forward to being alone and traveling together when the kids move out. What do you plan on doing when you are done with this trip? Did Vanture do your conversion? They were wonderful for us. I saw your website and while I can understand how you take a trumpet with you, how does your wife manage the piano? When we're done, we're going to be living back in Boulder. We're debating if we'll keep the bus for occaisional trips, or sell it. You are so mean to that boy! I enjoyed reading your Maine adventures in the May issue of Bus Conversions magazine. It it very informative. We have been to Maine without our coach (we didn't have one then. and we enjoyed the trip..like eating lobster..mussels and clams...me actually..my husband..well he is more like fish person. So keep doing what you're doing..more power to YOU. HA! So, not everyone cries a river over "poor Tim." Geez. He IS living his dream, after all. This page contains a single entry from the blog posted on April 22, 2005 7:50 PM. The next post in this blog is 'Til Death Valley Do Us Part.